The Assassin's Creed series was always known because of the accuracy in the recreating a certain epoch, so while playing you can even learn about some important historical events much better than from the school books. The next instalment in the series - Black Flag - will tell us about the Golden Age of Piracy. The era of piracy was an extremely unique time with its own laws, lifestyle, heroes and different things they used. A lot of drinking and plenty of temptations, many local wars and robberies, money, treasures and various hazards were on the way of a typical pirate. And of course, he had to be able to defend himself and even attack the average opponent to take all the money of the latter one. 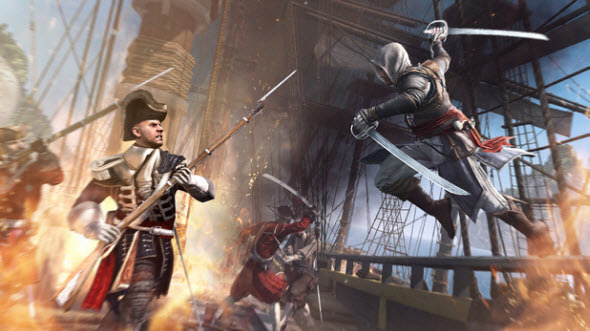 To be good in fighting, you need a weapon, and in Assassin's Creed 4 video those weapons are detailed. The trailer we want to show you is the next part of the peculiar developers' diaries, in which the real people try the life of pirates and tells us more about it. In this Assassin's Creed video Mike Loades - the historical expert - describes the weapons that were used by rovers. And you'd be surprised to learn, how various the guns and swords were and how difficult it was to defeat a pirate. By the way, yesterday we showed you the previous part of this video series, which can be reviewed here.